Experience the power of community as The Orange Ribbon Walk brings together people to rise against racism, one step at a time. 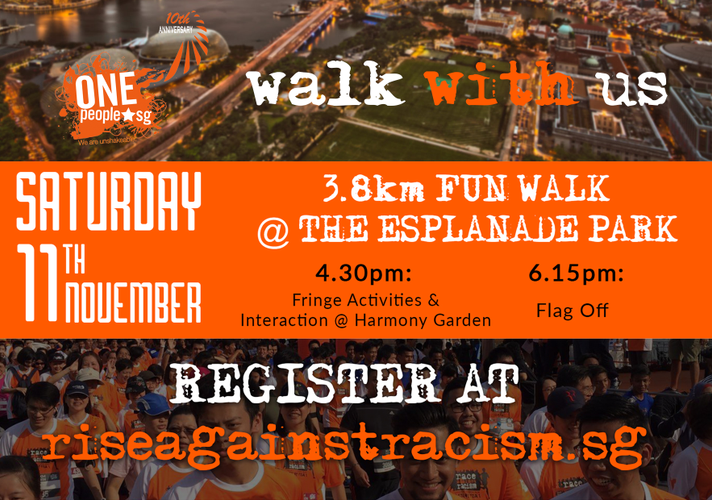 The event will feature a fun 3.8km walk along iconic attractions of Singapore as well as Harmony Garden, an inspiring exhibition co-created with you, our supporters! An enchanting display of the kites collected from our Racism GoFlyKite event and flags representing our rich cultural fabric will not only add colour but also make the walk a meaningful one, with heart-warming messages written on the kites. This is only the beginning of our journey towards building harmony in Singapore. By rising as one nation, we hope to build understanding and trust but most importantly, lasting friendships. Sign up with your loved ones and enjoy the beautiful sights of Singapore as the sun sets!